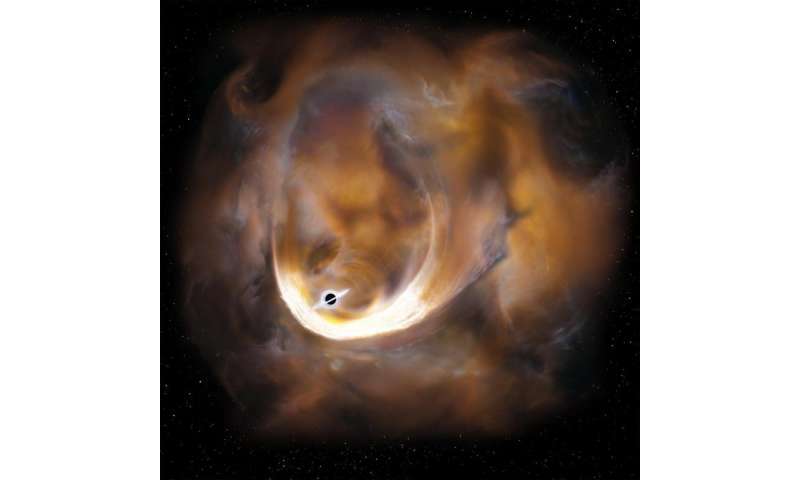 Artist’s impression of the clouds scattered by an intermediate mass black hole. Astronomers using the Nobeyama 45-m Radio Telescope have detected signs of an invisible black hole with a mass of 100 thousand times the mass of the Sun around the center of the Milky Way. The team assumes that this possible "intermediate mass" black hole is a key to understanding the birth of the supermassive black holes located in the centers of galaxies. 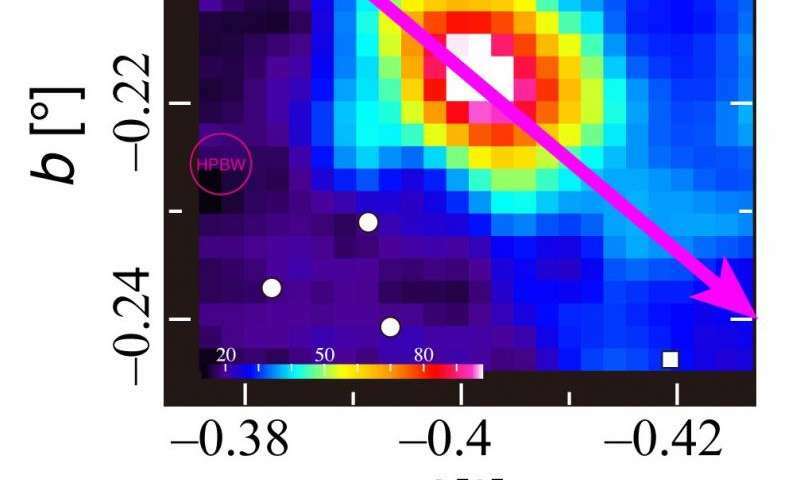 A team of astronomers led by Tomoharu Oka, a professor at Keio University in Japan, has found an enigmatic gas cloud, called CO-0.40-0.22, only 200 light years away from the center of the Milky Way. What makes CO-0.40-0.22 unusual is its surprisingly wide velocity dispersion: the cloud contains gas with a very wide range of speeds. The team found this mysterious feature with two radio telescopes, the Nobeyama 45-m Telescope in Japan and the ASTE Telescope in Chile, both operated by the National Astronomical Observatory of Japan. To investigate the detailed structure, the team observed CO-0.40-0.22 with the Nobeyama 45-m Telescope again to obtain 21 emission lines from 18 molecules. 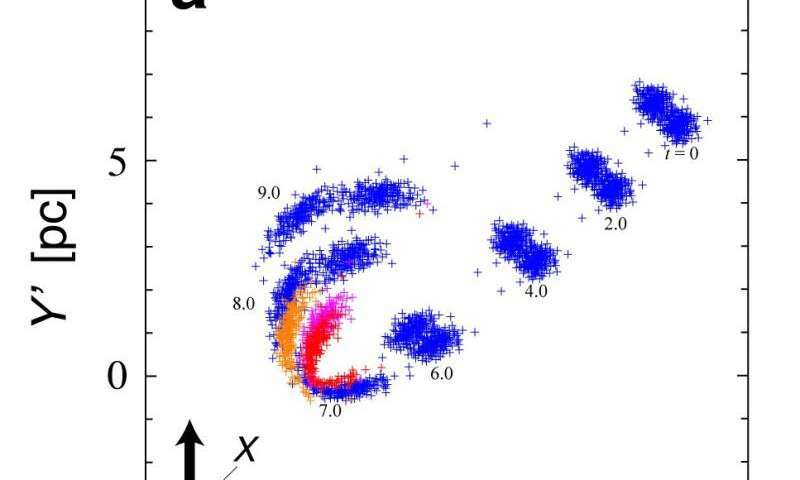 The results show that the cloud has an elliptical shape and consists of two components: a compact but low density component with a very wide velocity dispersion of 100 km/s, and a dense component extending 10 light years with a narrow velocity dispersion. What makes this velocity dispersion so wide? There are no holes inside of the cloud. Also, X-ray and infrared observations did not find any compact objects. These features indicate that the velocity dispersion is not caused by a local energy input, such as supernova explosions. 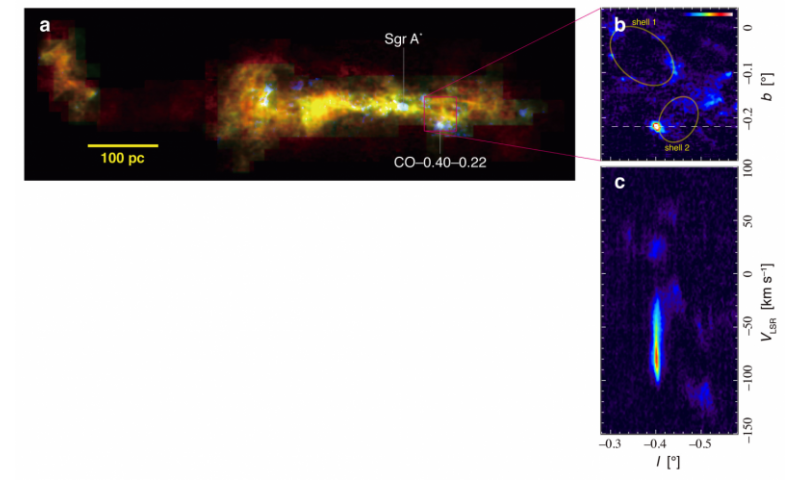 (a) The center of the Milky Way seen in the 115 and 346 GHz emission lines of carbon monoxide (CO). The white regions show the condensation of dense, warm gas. (b) Close-up intensity map around CO-0.40-0.22 seen in the 355 GHz emission line of HCN molecules. The ellipses indicate shell structures in the gas near C0-0.40-0.22. (c) Velocity dispersion diagram taken along the dotted line shown above. The wide velocity dispersion of 100 km/s in CO-0.40-0.22 stands out. The team performed a simple simulation of gas clouds flung by a strong gravity source. In the simulation, the gas clouds are first attracted by the source and their speeds increase as they approach it, reaching maximum at the closest point to the object. After that the clouds continue past the object and their speeds decrease. The team found that a model using a gravity source with 100 thousand times the mass of the Sun inside an area with a radius of 0.3 light years provided the best fit to the observed data. "Considering the fact that no compact objects are seen in X-ray or infrared observations," Oka, the lead author of the paper that appeared in the Astrophysical Journal Letters, explains "as far as we know, the best candidate for the compact massive object is a black hole." If that is the case, this is the first detection of an intermediate mass black hole. Astronomers already know about two sizes of black holes: stellar-mass black holes, formed after the gigantic explosions of very massive stars; and supermassive black holes (SMBH) often found at the centers of galaxies. The mass of SMBH ranges from several million to billions of times the mass of the Sun. A number of SMBHs have been found, but no one knows how the SMBHs are formed. One idea is that they are formed from mergers of many intermediate mass black holes. But this raises a problem because so far no firm observational evidence for intermediate mass black holes has been found. If the cloud CO-0.40-0.22, located only 200 light years away from Sgr A* (the 400 million solar mass SMBH at the center of the Milky Way), contains an intermediate mass black hole, it might support the intermediate mass black hole merger scenario of SMBH evolution. (Top) CO-0.40-0.22 seen in the 87 GHz emission line of SiO molecules. (Bottom) Position-velocity diagram of CO-0.04-0.22 along the magenta line in the top panel. These results open a new way to search for black holes with radio telescopes. Recent observations have revealed that there are a number of wide-velocity-dispersion compact clouds similar to CO-0.40-0.22. The team proposes that some of those clouds might contain black holes. A study suggested that there are 100 million black holes in the Milky Way Galaxy, but X-ray observations have only found dozens so far. Most of the black holes may be "dark" and very difficult to see directly at any wavelength. "Investigations of gas motion with radio telescopes may provide a complementary way to search for dark black holes" said Oka. "The on-going wide area survey observations of the Milky Way with the Nobeyama 45-m Telescope and high-resolution observations of nearby galaxies using the Atacama Large Millimeter/submillimeter Array (ALMA) have the potential to increase the number of black hole candidates dramatically." The observation results were published as Oka et al. "Signature of an Intermediate-Mass Black Hole in the Central Molecular Zone of Our Galaxy" in the Astrophysical Journal Letters issued on January 1, 2016. The research team members are Tomoharu Oka, Reiko Mizuno, Kodai Miura, Shunya Takekawa, all at Keio University. (Top) Simulation results for two moving clouds affected by a strong compact gravity source. The diagram shows changes in the positions and shapes of the clouds over a period of 900 thousand years (starting from t=0) at intervals of 100 thousand years. The axes are in parsecs (1 parsec = 3.26 light years). (Bottom) Comparison of observational results (in gray) and the simulation (red, magenta, and orange) in terms of the shape and velocity structure. The shapes and velocities of the clouds at 700 thousand years in the simulation match the observational results well. Well, just last year a neutron star was found close to the original black hole, so is this the evolved neutron star or is it still there in addition to this? Indeed, merger maniacs are stuck with an inverted model. This is likely an example of a intermediate core diverging from the central core, but not having had enough time to grow supermassive, as in this case of Arp 220 where the separation between the parent and daughter has grown some five times greater. "A study suggested that there are 100 million black holes in the Milky Way Galaxy"
Now we know where all the dark matter is. Black Holes, millions of them per galaxy. The andromeda galaxy weighs approximately 15,000,000,000,000 suns, any number of millions doesn't account for even 1% of its apparent mass. @katesisco - we would have seen a heck of a lot of fireworks if a neutron star in our own galaxy had grown to a 100,000-suns mass black hole in one year, so this is a different beast. Spiral inside a spiral- Is it a wonder ! How do you look at 3 in one ?? 1000 spirals -collection create a Guinness book of records- 20 years back. where is Science heading ? Anarchy-confusion - or even dis-honest set modes ??? I do not see scientific reason the objects which is observed to have powerful gravitational influence on nearby vicinity to be called black holes - which are only mathematical objects as a consequence of mathematical (not physical) GR theory. I'm glad you've finally admitted that! And then I stop reading. Typical crank's core dysfunction AGAIN; no ability to conceptualize scale. Ever occurred to you that none of these tw*ts have ever actually done physics? Don't put it beyond the realm of possibilities. In my experience they can't even do maths!